What better way to celebrate Halloween than taking a tour of Haddonfield itself!? 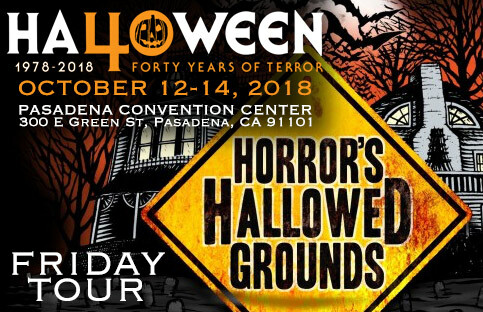 On this tour you will see filming locations from such films as Halloween (1978), Halloween II (1981), Halloween III: Season of the Witch, Rob Zombie’s Halloween (2007) as well as other horror classics – plus more! There will be locations on this tour that we have NEVER visited on prior HHG tours. The tour will last about 5-6 hours, so bring plenty of film and/or extra batteries for those digital cameras. There will be locations during the tour where you could grab a snack or lunch, but if you wish to bring your own lunch, snacks, or drinks - that is welcome. Also make sure to wear comfortable shoes because there will be walking portions of the tour. The tour will take place on Friday, October 12th at 10:00 am leaving from the Pasadena Convention Center. *Exact locations visited as well as estimated tour time may differ due to traffic or weather. Bus tour tickets are limited in numbers and will not be available at the event (this is a pre-sale ONLY event). Tickets are available for purchase in advance for a limited time, while supplies last. All sales are final. HORROR’S HALLOWED GROUNDS: DRINKS WITH TOM ATKINS! 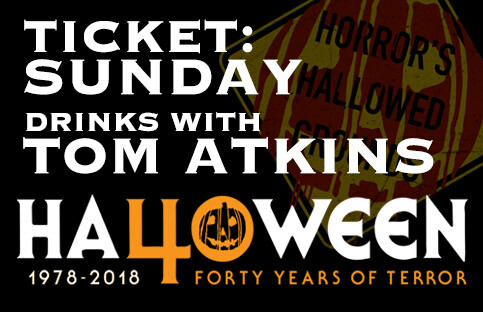 On Sunday evening, October 14th, after all of the dust has settled from the Halloween: 40 Years of Terror convention, what better was to end the weekend then with a once-in-a-lifetime chance to have drinks with the MAN himself; Tom Atkins!!! And even better yet, at the bar from Halloween III: Season of the Witch!!!! This will be limited to 50 people. A bus will pick you up from the convention center on Sunday evening (Exact Time TBD) and drive you to beautiful Sierra Madre to the actual bar from Halloween III. You will be able to pull up a stool and take a photo sitting at the bar with Tom in the very spot he sat in the film. You will also receive a special event Tom Atkins pint glass. Enjoy a drink before your guide takes you on a special “nighttime” walking tour of filming locations from Halloween II, Halloween III: Season of the Witch, Psycho III, Return of the Living Dead Part 2, and the church from The Fog. After the walking tour, the bus will take you back to the convention center. Hope to see you there!!! The event will take place on Sunday, October 14th - after H40 has ended (time TBA) - leaving from the Pasadena Convention Center. This ticket will include a limited edition Tom Atkins pint glass, made especially for this event.